The message and miracle of Our Lady of Fatima in 1917 is one of the greatest events in the history of the Catholic Church. Since the miracle at Fatima, which occurred on Oct. 13, 1917, was predicted to take place in advance, and was fulfilled in the presence of almost 100,000 people, it’s probably the greatest miracle in Catholic history outside the Resurrection. The Fatima miracle and message also bear tremendous significance for our topic: The Truth about What Really Happened to the Catholic Church after Vatican II. 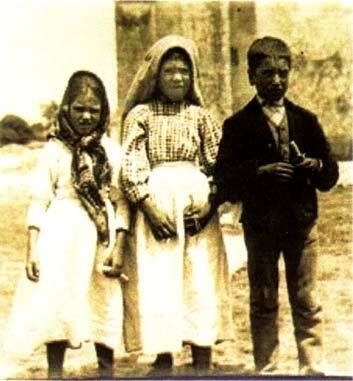 Beginning on May 13, 1917, the Mother of God appeared six times to Jacinta (age 7), Francisco (age 9) and Lúcia (age 10) in Fatima, Portugal. The Blessed Virgin told the children to pray the Rosary every day; she showed them a vision of Hell; and she made prophecies about World War II and the expansion of Communism (“the errors of Russia”), among other things. “You've seen Hell, where the souls of poor sinners go. To save them God wishes to establish in the world the devotion to my Immaculate Heart,” Our Lady said. The First Secret of Fatima: Hell is a reality and most are condemned. “As She spoke these last words, She opened Her hands once more, as She had done the two previous months. The rays [of light] appeared to penetrate the earth, and we saw as it were a sea of fire. 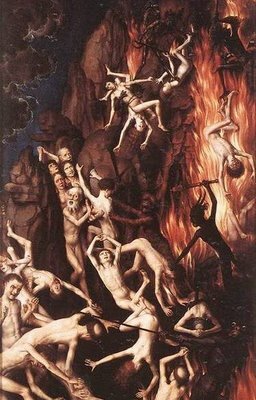 “Plunged in this fire we saw the demons and the souls [the damned]. The latter were like transparent burning embers, all blackened or burnished bronze, having human forms. They were floating about in that conflagration, now raised into the air by the flames that issued from within themselves, together with great clouds of smoke. Now they fell back on every side like sparks in huge fires, without weight or equilibrium, amid shrieks and groans of pain and despair, which horrified us and made us tremble with fright. (It must have been this sight which caused me to cry out, as people say they heard me. Apocalypse 2:6 (1582 D-R): But this thou hast, “because thou hatest the facts” of the Nicolaites, which I also hate. Protestant Bill Wiese is given a tour of Hell for 23 minutes by the “the lord's” Jesus (not Jesus Christ who is God). Unable to figure it out, he and his wife continue to preach Protestantism and the lord's fire to this day. Sounds from Hell recorded by Siberian Miners (18 sec) from 1960. Since the children had announced months in advance of Oct. 13 that the Lady would work a miracle, 70,000 to 100,000 people gathered at Fatima on Oct. 13 to see the miracle that was predicted to take place. There were also many nonbelievers who came to scoff when the predicted miracle didn’t occur. 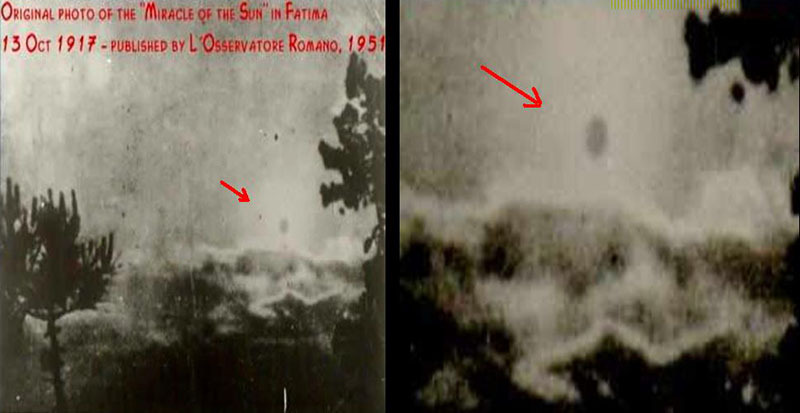 However, as even the secular press confirmed, the Miracle of the Sun – as it’s now known – did occur, just as it was predicted by the children and by Our Lady of Fatima. It stunned the gathered multitude, converted hardened unbelievers, including atheists and Freemasons, and confirmed thousands in the Catholic Faith. 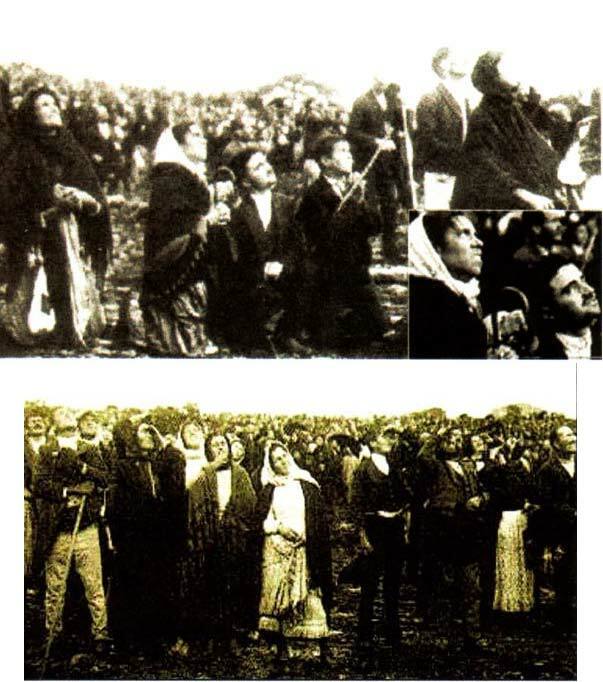 What was the Miracle of the Sun that so stunned and converted the enraptured audience of 70,000-plus at Fatima on Oct. 13, 1917? A brief examination of the miracle and its significance will go a long way in revealing: The Truth about What Really Happened to the Catholic Church after Vatican II. “The sun stood forth in the clear zenith like a great silver disk which, though bright as any sun they had ever seen, they could look straight at without blinking, and with a unique and delightful satisfaction. This lasted but a moment. While they gazed, the huge ball began to ‘dance’ – that was the word all the beholders applied to it. Now it was whirling rapidly like a gigantic fire-wheel. After doing this for some time, it stopped. Then it rotated again, with dizzy, sickening speed. Finally there appeared on the rim a border of crimson, which flung across the sky, as from a hellish vortex, blood-red streamers of flame, reflecting to the earth, to the trees and shrubs, to the upturned faces and the clothes all sorts of brilliant colors in succession: green, red, orange, blue, violet, the whole spectrum in fact. Madly gyrating in this manner three times, the fiery orb seemed to tremble, to shudder, and then to plunge precipitately, in a mighty zigzag, toward the crowd. During the miracle the sun was seen to be speeding toward the earth and the people thought the end of the world had come. The significance should be obvious: Fatima was an apocalyptic sign; it was a sign that the end was near, that the events which would precede the culmination of the world and the Second Coming of Jesus Christ were to begin. Men must amend their lives before the end of the world really came. 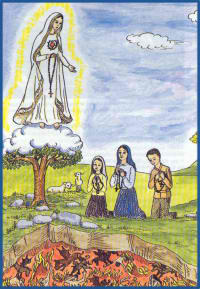 The Fatima seers also reported that Our Lady was made all of light – she was more brilliant than the sun. The evidence is very strong that Our Lady of Fatima was the woman clothed with the sun prophesied in the Apocalypse, chapter 12. In fact, there is a stunning confirmation that Our Lady’s appearance at Fatima was the fulfillment of the prophecy in the Apocalypse about the woman clothed with the sun. Please notice that the Masonic, anti-clerical daily of Lisbon described the event of Fatima and the Miracle of the Sun as “The sign of Heaven.” Does that sound familiar? Are we to believe that the Masonic newspaper of Lisbon had Apocalypse 12:1 in mind when publishing this article shortly after the solar prodigy in 1917? Were the anti-clericals considering the possibility that Our Lady’s appearance constituted the woman clothed with the sun and the “sign of Heaven” described in the Bible? Of course not; not even Catholics at that time had connected Fatima with the woman clothed with the sun, let alone the anti-clericals who didn’t even believe in Sacred Scripture or probably didn’t even know about the prophecy in Apoc. 12:1! This headline, therefore, is an unknowing confirmation, by a public and anti-Catholic source, that Our Lady of Fatima and her miracle on Oct. 13 were indeed the sign prophesied in Apocalypse 12:1! This stunning fact not only serves to confirm that Our Lady of Fatima is the woman clothed with the sun of Apoc. 12:1, but also further confirms the authenticity of the Catholic Faith and Sacred Scripture. Therefore, to finally round out our point about Fatima and its relevance to what has happened to the Catholic Church after Vatican II, we can say: since Fatima was the sign prophesied in Apoc. 12:1, this means that we are in the Apocalyptic era, the last days of the world. Lending further support to the idea that Fatima was the “sign” of Apocalypse 12:1 is the fact that the Apocalypse speaks of the “great red dragon” just two verses later. Scripture seems to indicate that the two will come on the scene at the same time. Many commentators consider the “great red dragon” to be Communism, since Communism is undeniably associated with red, and was responsible for the murder of over 20 million people in Russia alone. Under Vladimir Lenin, the Bolsheviks took over Russia for Communism – gaining the significant victory which would make Communism a world power – on Nov. 7, 1917, immediately after the appearances of Our Lady in Fatima, which had warned of the spread of “the errors of Russia.” (7) Even today we speak of Communist China as “Red China.” The Communist revolution in China was launched in celebratory fashion by men with “Enormous red banners, tens of thousands of red flags, and masses of red balloons flew over them.” (8) The evidence that the “great red dragon” describes the Communist Empire is quite strong. Is it just a coincidence that Communism, at its height, held a third of the world in its grasp? 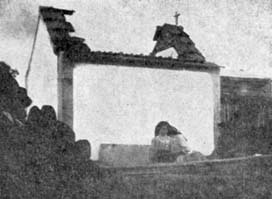 Jacinta Marto was one of the three original visionaries at Fatima, Portugal in 1917. She was born in 1910 and died in 1920. 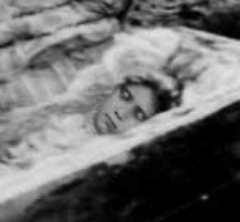 In both 1935 and 1951 her body was exhumed and in each instance, her body was found to be incorrupt. The Basilica of Our Lady of Fatima was built on the site where the three children first saw "a lady brighter than the sun" and Jacinta's tomb has remained there since 1951. Months passed, and there began to be new rumors that the statue was to be stolen and the chapel burned down. So we thought it would be better to take the statue to my home and bring it to the chapel every morning. It must have been about the end of October, when my husband brought Our Lady to our home in Moita. We arranged a little altar in the sitting room, and put the statue on it with two oil lamps burning. We were perfectly right to be afraid, for on March 6 of the next year we heard a terrible explosion during the night. The Freemasons had placed four bombs in the chapel, and a fifth by the tree where Our Lady appeared. The roof was blown off, but the bomb by the tree did not explode. More of the story here. “Father, the Most Holy Virgin did not tell me that we are in the last times of the world but she made me understand this for three reasons. The first reason is because she told me that the Devil is in the mood for engaging in a decisive battle against the Virgin. And a decisive battle is the final battle where one side will be victorious and the other side will suffer defeat. Hence from now on we must choose sides. Either we are for God or we are for the Devil. There is no other possibility. “The second reason is because she said to my cousins as well as to myself that God is giving two last remedies to the world. These are the Holy Rosary and Devotion to the Immaculate Heart of (Our Lady). These are the last two remedies which signify that there will be no others. These are the last words given before the undisclosed third secret of Fatima. From this scholars of Fatima have concluded that the third secret undoubtedly deals with a massive spiritual crisis and apostasy from the Catholic Faith among those who purport to hold positions of authority in the Church. Since we don’t have the complete sentence of Our Lady’s last words of the July message, we cannot say for sure what they mean; but the sentence could be: “In Portugal the dogma of Faith will always be preserved in a faithful remnant …” Or: “In Portugal the dogma of Faith will always be preserved until the Great Apostasy…” Or: “In Portugal the dogma of Faith will always be preserved among those who heed my warnings…” The third secret undoubtedly deals with the present apostasy of the Vatican II sect. We will document this apostasy in great detail in this book. Another “cardinal” of the Vatican II Church incredibly admitted that the Third Secret deals with the post-Vatican II apostasy. All testimonies and statements reveal clearly that Heaven wanted the third secret of Fatima revealed to the whole world no later than 1960, because it would be clearer then. Why would the third secret of Fatima be clearer in 1960? This council called by John XXIII in 1959 would turn out to be Vatican II, the disastrous results of which are the subject of this book. Is the calling of this council in 1959 the reason that Our Blessed Mother requested the third secret of Fatima to be revealed by 1960? Was she directly warning us of the apostasy that would result from this council, which truly gave birth to a new, phony Counter-Catholic Church, as we will see in this book? Truly, the only major sign that had occurred by 1960, in regard to the tremendous apostasy we are now living through that would makes things “clearer,” was that John XXIII had announced his intention to call a new council in 1959. In our view, it’s quite obvious that the third secret of Fatima deals with the apostasy resulting from a false council; otherwise the third secret wouldn’t make more sense in 1960, as Our Blessed Mother said it would. (1) Ciappi’s personal communication to a Professor Baumgartner in Salzburg, cited in The Devil’s Final Battle, compiled by Paul Kramer, Good Counsel Publications, 2002; also cited by Father Gerard Mura, “The Third Secret of Fatima: Has It Been Completely Revealed?”, the periodical Catholic (published by the Transalpine Redemptorists, Orkney Isles, Scotland, Great Britain), March 2002. (2) William Thomas Walsh, Our Lady of Fatima, Doubleday Reprint, 1990, p. 81. (3) William Thomas Walsh, Our Lady of Fatima, p. 80. (4) William Thomas Walsh, Our Lady of Fatima, pp. 145-146. (5) William Thomas Walsh, Our Lady of Fatima, p. 148. (6) Portuguese Newspaper, O Seculo, Oct. 15, 1917. (7) Warren H. Carroll, The Rise and Fall of the Communist Revolution, Front Royal, Virginia: Christendom Press, p. 93. (8) Warren H. Carroll, The Rise and Fall of the Communist Revolution, p. 538. (9) Warren H. Carroll, The Rise and Fall of the Communist Revolution, p. 418. (10) Sr. Lucy’s interview with Fr. Fuentes, quoted in The Whole Truth About Fatima by Frere Michel de la Sainte Trinité, Buffalo, NY:Immaculate Heart Publications, Vol. 3, p. 503 ff. (11) Ciappi’s personal communication to a Professor Baumgartner in Salzburg, cited above. (12) Silvio Oddi, The Meek Watchdog of God, Rome: Progetto Museali Editore, 1995, pp. 217-218. The Third Secret of Fatima according to Freemason Malachi Martin.